Illustration of the Hawaiian goddess Pele. Pele is the goddess of fire, lighting, and volcanoes in Hawaiian indigenous religion. 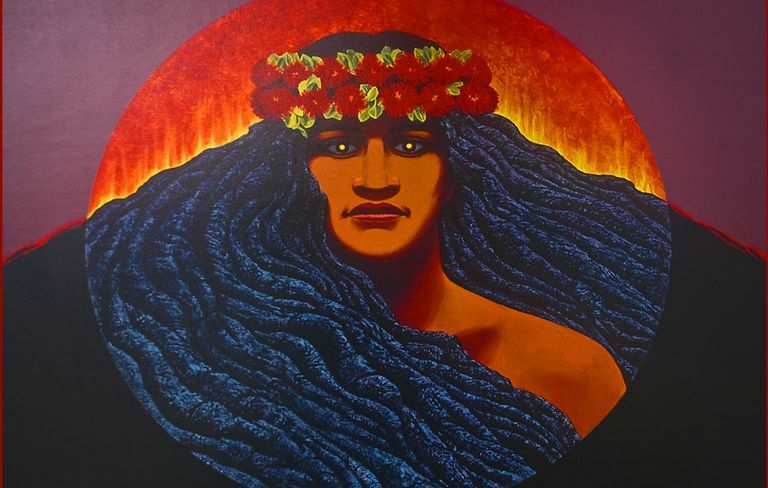 She is sometimes called Madame Pele, Tutu (Grandmother) Pele, or Ka wahine ʻai honua, the earth-eating woman. According to Hawaiian legend, Pele is the creator of the Hawaiian Islands. There are thousands of divine beings in Hawaiian religion, but Pele is perhaps the best known. She is a descendant of the Sky Father and a spirit named Haumea. As the goddess of the element of fire, Pele is also considered an akua: the sacred embodiment of a natural element. There are a number of folktales that characterize Pele's origins. According to one folktale, Pele was born in Tahiti, where her fiery temper and indiscretions with her sister's husband got her into trouble. Her father, the king, banished her from Tahiti. Pele traveled to the Hawaiian islands in a canoe. Soon after she landed, her sister arrived and attacked her, leaving her for dead. Pele managed to recover from her injuries by fleeing to Oahu and the other islands, where she dug several giant fire pits, including the one that is now the Diamond Head crater and Maui’s Haleakala volcano. When Namakaokahai found out Pele was still alive, she was livid. She chased Pele to Maui, where the two of them battled to the death. Pele was torn to pieces by her own sister. She became a god and made her home on Mauna Kea. Although Hawaii is now part of the United States, it hasn’t always been so. In fact, for hundreds of years, the Hawaiian Islands have faced conflict with European and American forces. The first European to encounter Hawaii was Captain James Cook in 1793, which paved the way for traders, merchants, and missionaries to take advantage of the islands’ many resources. They were generally opposed to Hawaii’s traditional monarchy, and constantly pressed the island government to adopt a constitutional monarchy like that found in Britain and other European nations. A century later, in 1893, Hawaii’s Queen Liliuokalani was forced to abdicate her throne by sugar planters and businessmen who had organized a political coup. A series of violent clashes led to Liliuokalani’s eventual arrest for treason.Within five years, the United States had annexed Hawaii, and in 1959, it became the 50th state in the union. For Hawaiians, Pele has emerged as a symbol of the resilience, adaptability, and power of the indigenous culture of the islands. Her fires create and destroy the land itself, forming new volcanoes that erupt, cover the land with lava, and then begin the cycle anew. She is a representative of not just the physical aspects of the Hawaiian Islands, but also of the fiery passion of Hawaiian culture. The Kilauea volcano is one of the most active in the world, and has been regularly erupting for decades. Sometimes, however, Kilauea becomes more active than usual, and the lava flow places neighborhoods in danger. It’s commonly accepted that Pele will bring bad fortune upon anyone foolish enough to take any pieces of lava or rocks home from the islands as a souvenir. In May 2018, Kilauea began to erupt so violently that entire communities were forced to evacuate. Some Hawaiian residents made offerings of flowers and Ti leaves in the cracks in the roads in front of their homes as a method of appeasing the goddess. What Do You Want to Know About the Gods (Orishas) of Santeria?